Wednesday-Sunday 5:30 p.m. - 11:00 p.m.
As a long time Michael Symon fan, my expectations were pretty high. They were surpassed. The staff was personable and at the top of their game. The food was superb. The prime rib was the best I've ever had; the English peas blew me away; the Caesar salad was definitive. I would have loved to have dessert but simply could not eat another bite. I haven't even touched on the cocktails or the spirits and wine collection. Amazing experience and not to be missed! The staff was very friendly and helpful in making recommendations about the food and drinks. They were also very attentive to the needs of the customers. I ordered the fried chicken because I couldn’t find anything else on the menu I liked. Although it was very good, the food was very pricey. Our server was very attentive, and did a great job. I found that the menu was very limited. 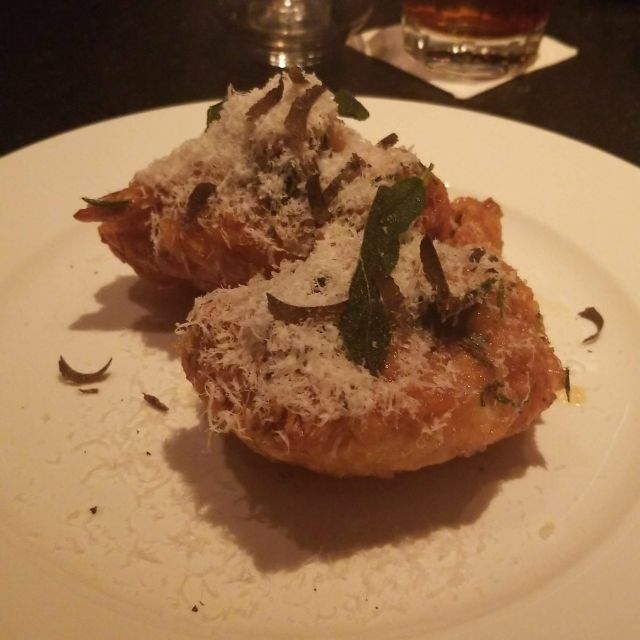 A “secret” restaurant with outstanding service, fantastic cocktails and classic, superbly executed food. While definitely pricey, this is an EVENT meal. 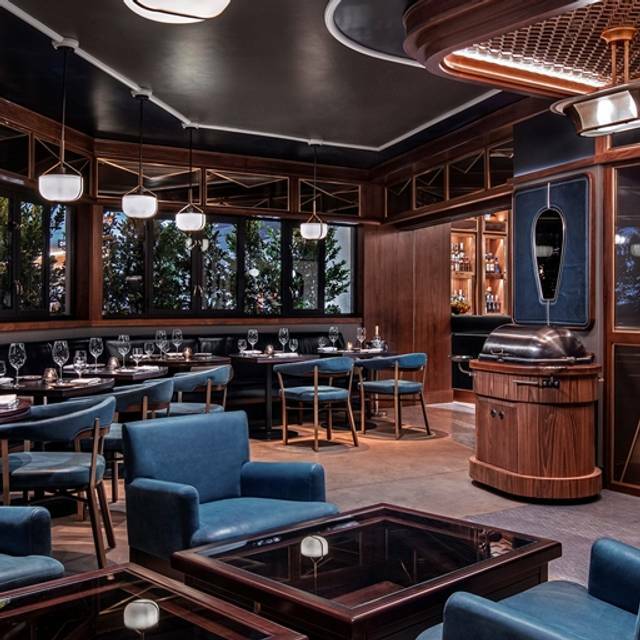 Tucked into the side of Mabel's BBQ and behind a couple of discreet doors, the dining room is stunning in velvets, and metals -- think mid-century modern meets 2019. Staff was personable, friendly and professional. Drinks were inventive and lovingly dressed in gorgeous barware. Staff did a great job describing menu items in detail. Truffle Fried Chicken, Dover Sole, Crispy Brussels Sprouts, Potato Leek Gratin were all wonderful. 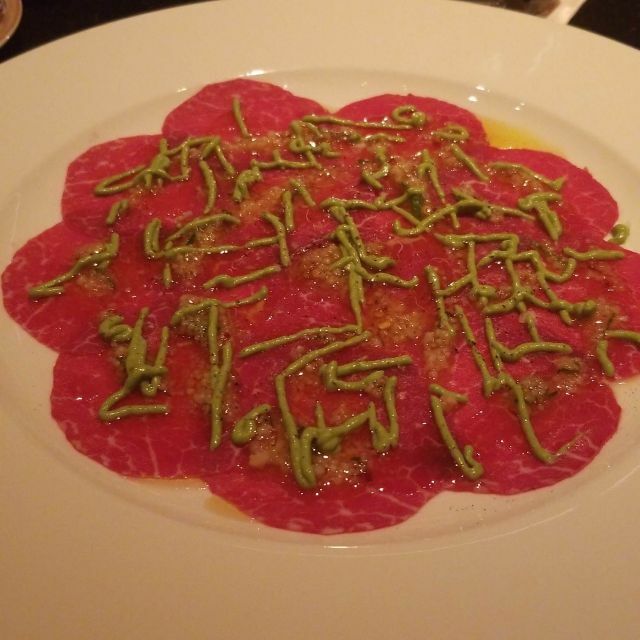 The Beef Carpaccio was an amazing start to the meal. Such a treat to have table side service (Dover Sole and Bananas Foster). Bananas Foster was a perfect end to the meal, beautifully prepared, and not cloyingly sweet. Will definitely return when in Vegas again. Food and service were excellent. I felt like the volume level of the music was a little loud and took away from the intemency of the restaurant. My wife loves Michael since watching him on the Chew. He is a down to earth nice guy. Willing to take time and make you feel comfortable when talking with him. The service from Andrew and Rich was attentive without being obtrusive. They made for a great evening. Sara’s is currently our new number one. Absolutely the most incredible experience ever. The food was phenomenal. I have dined at some amazing places, but none even came close to the level of execution at Sara's. Absolutely the best! What an incredible experience! From the hostess all the way through to dessert, the team, the atmosphere, and, of course, the food and drinks were world class. Special thanks to Shannon, Danielle, Robert and Dennis for making our first trip to Sara's unforgettable. The beef carpaccio and prime rib were incredible. Sara’s is a gem! The decor and vibe right from the start let’s you know this is going to be an “experience” not just another meal. We were greeted with a champagne cocktail and given an extensive craft cocktails list. We ordered a martini and an old fashioned. We then started our meal with Oysters and Beef Carpaccio, split Prime Rib (which is served with freshly grated horseradish -yum), Potato Dumplings and Brussels Sprouts. All cooked perfectly and perfectly delicious. We will be back! This place is amazing. The food.. drinks.. just have to see for yourself. Nothing I can write will do it justice for any foodie. And the speakeasy feel just tossed it over the top. Thank you for an amazing night! The food was incredible and so was the service. I don’t usually order lobster at a restaurant but with the buerre blanc and lemon? So good! The smoked prime rib is a must have. I wish they had more vegetable options, otherwise the menu is great. Their cocktails are also very well done. Can not recommend enough! Great food and cocktails. My waiter had excellent recommendations on both cocktails and food. The recommendation for the Truffle Fried Chicken was greatly appreciated. Excellent decor and staff was well trained and attired. A wonderful meal! Service was outstanding. 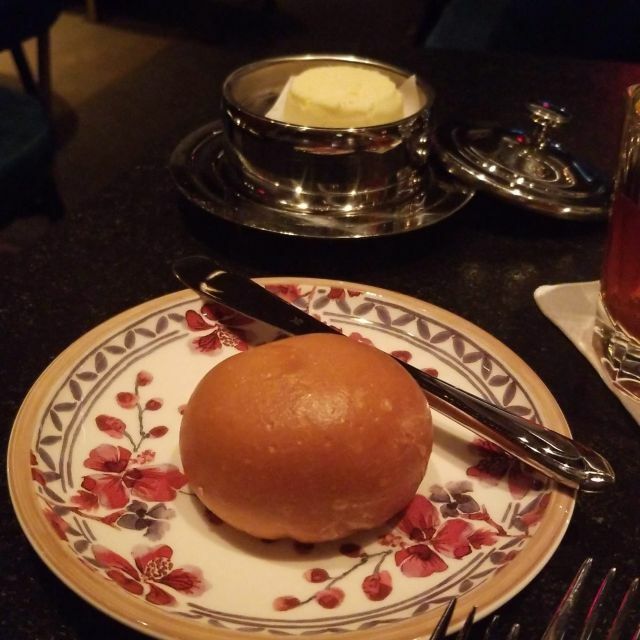 This restaurant is a throwback to old world Las Vegas from the way you enter through an unmarked door to the decor to the service. A team of waitstaff are friendly, helpful and excellent at their job! We told them that we wanted a leisurely dinner and that is exactly what we got. The food is delicious and we tried a lot of it! My favorites had to be the lobster Cobb which was just fabulous and the lobster was excellent! Also the fried chicken needs to be tasted to be believed. It is that good. It is also fairly large and you might want to plan on splitting. I would be remiss to not mention the cocktail menu which is quite large and is again a throwback to old Las Vegas. I had a Bourbon Old Fashioned which was excellent! Chef Symon was at the restaurant and it was a pleasure to meet him. We will definitely be back here! Unique speak easy hidden behind Mabel's BBQ. We had the truffle chicken and prime rib. Both were excellent. I normally drink Manhattan's but tried there version of Old Fashion. Very good. We will definitely return. Great food, service and ambiance. Such a great experience and location. Service was a team approach and very attentive . Loved the ambiance and energy of this intimate dining space. Portions were generous. Do not miss the Brussel sprouts! No kidding! Highly recommend for a memorable meal. Very fun night. Great food and wonderful service. Vibe is cool casual elegance. First of all, wow. Get ready to feel like you are back in the 20s and 30s from the moment you step into the hidden restaurant. Words really can't describe the sensory overload when you first walk in the quaint little establishment. You are greeted by waitresses in high class tuxedos, jazz type music, lots of beautiful blues and golds all in a very small area of maybe 20 tables. The wait staff were amazing and the food was great. 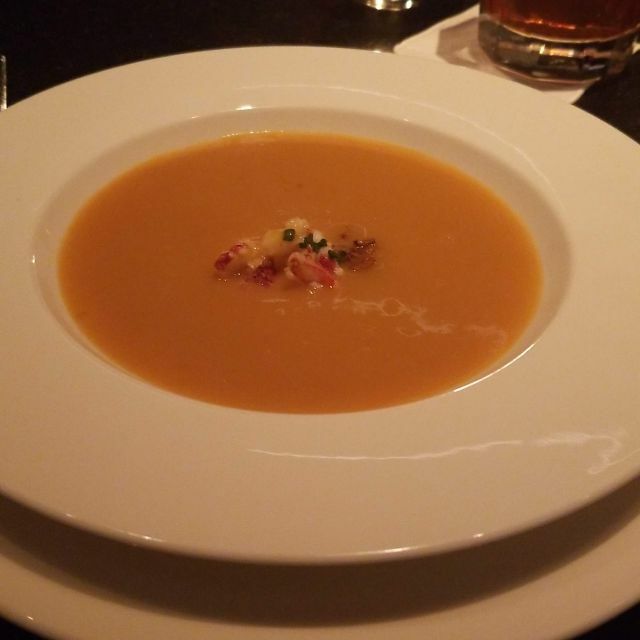 The reason for my food being a 4/5 was that for the price, I expected perhaps a little more lobster soup than what arrived and the potato leek gratin just didn't wow me...the chardonnay by the glass also was not great. Negatives aside, the rest was spectacular. The prime rib with au jus and fresh horse radish topped with crab bernaise was amazing. My husband loved his truffle chicken. The Brussle Sprouts will have you wanting to eat the entire side by yourself. 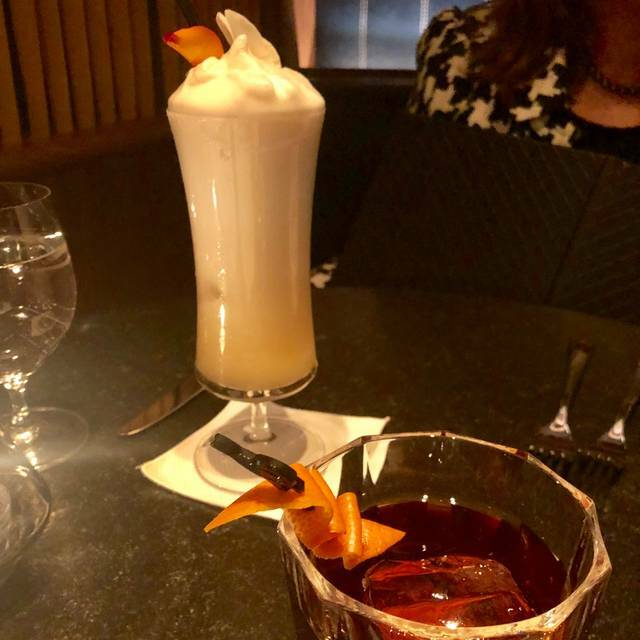 I know my husband got 2 different cocktails that he thoroughly enjoyed. My second glass of pinot was great. We eat at a lot of fairly expensive restaurants and we knew going in this would be expensive; however, it was probably our most expensive meal to date for the two of us. Prime Rib, Truffle Chicken, Brussle Sprouts, Lobster Soup, Ceasar and 4 cocktails plus desert and tip came to about $380. Now remember, you are paying as much for the experience as you are the food. It is definitely worth going so long as you are prepared to pay the actual price for fine dining, great service and wonderful food. Sara's was Awesome! We were there for an early dinner as we had to get to a show at 8:00 at another casino. I just asked the host if it was possible to eat and get out in an hour, and from that point everyone we interacted with knew our story. We never felt rushed, had a great dinner and made our show with no problems. Get the Brussel sprouts! I only whish I could have taken my leftovers with me. Details. Details. Details. Everything is so thought out and you can tell passion has been put into every detail of making Sara’s special. Sara’s was the highlight of my trip. Everything at Sara's was incredible. The spot is hidden within Mabel's BBQ - going through a panel in one of the walls makes the experience feel very exclusive. From there, welcome cocktails, superb service and some of the best food you've ever tried. The truffle fried chicken and smoke prime rib are wonderful. If you're visiting Vegas, you must make a reservation it will be the highlight of your trip. 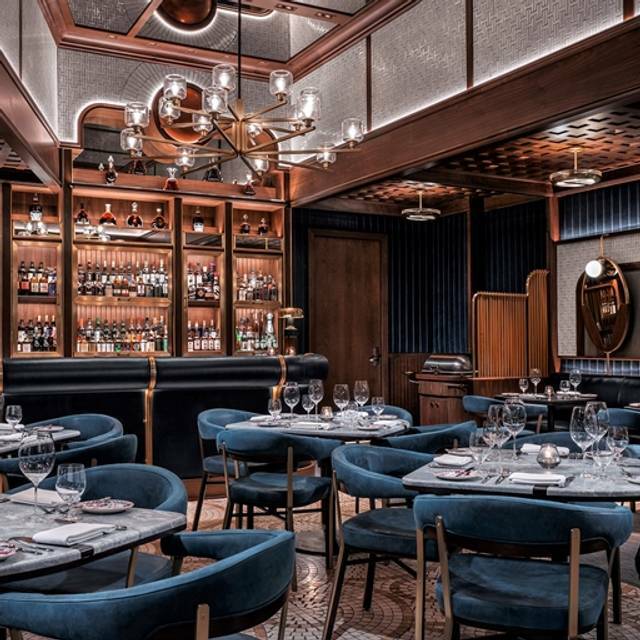 Michael Symon has created a unique restaurant in Las Vegas - quiet, elegant, superb service and exceptional food and drink. From the appetizers to the freshly prepared desserts the entire dining experience exceeded my expectations. The menu features meat, chicken and multiple seafood options, so there is something for everyone. Even more impressive, Chef Symon's business partner, Doug Petkovic (the namesake of the famous Fat Doug Burger) greeted us at our table and stopped by to chat at the end of our meal. He emphasized that that he and Michael are seeking out feedback on how they can make Sara's even better, and that one or the other has been at the restaurant since it opened. When I suggested a cigar lounge Doug pulled out a cigar from his jacket pocket but noted that even he wasn't allowed to smoke in the restaurant. 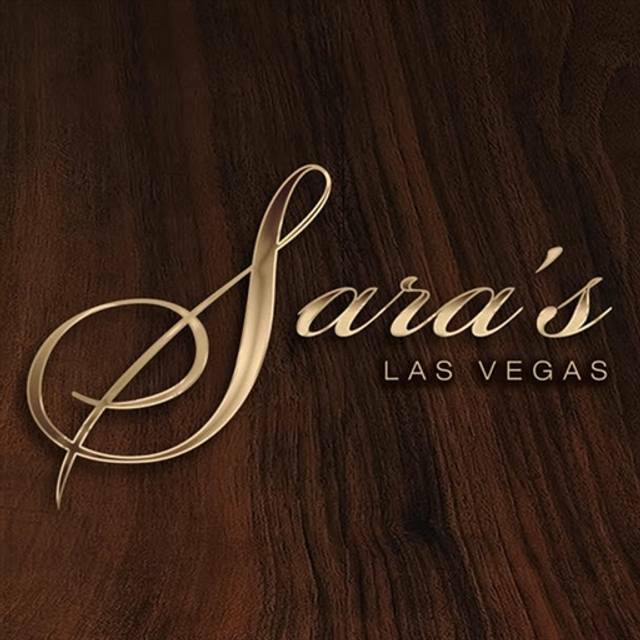 We will definitely dine at Sara's again when we return to Vegas. Dinner was exceptional. Great gin drinks on the menu as well as many others. Only marginal complaint was the seafood tower. Was $175 and was no where near what I would have expected for that price. For only being open for 3 weeks, this place is humming along. Who doesn't love a secret? And when you walk into Mabel's and tell them you have a reservation at Sara's, its like you're sharing that secret. You're whisked away and go through a wall to this beautiful space. You are greeted with a amuse cocktail and white jacketed waiters are eager to tell you about what's going on. 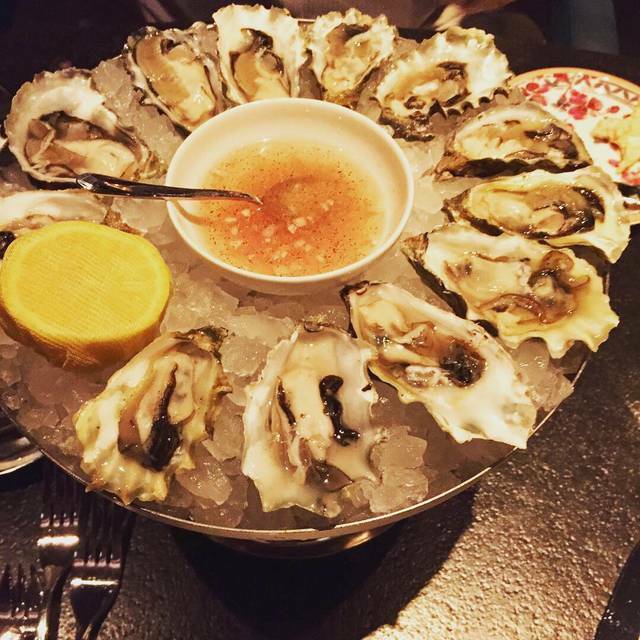 The food is great - from the tuna Tartare to the Escargot Casino (a beautiful play on old time Vegas) to some of the greatest Fried Chicken you have ever had in your life, nothing is bad. Sue and I look forward to the amazing food and service that they provide.